CAPTAIN Dudley Jacobs drowned in Gladstone harbour on June 11, 2011. 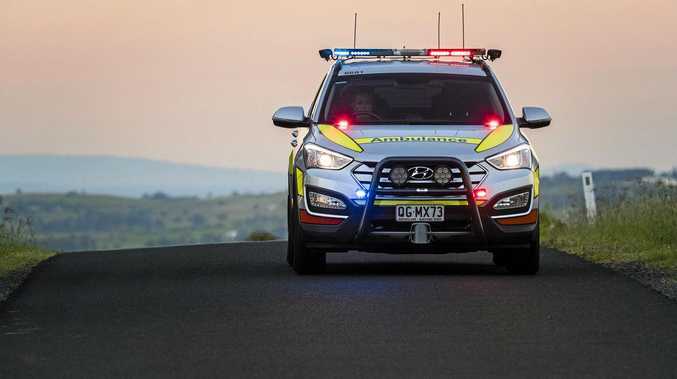 A coronial inquest into his death found the fatal capsize of the Adonis tug boat and Capt Jacobs death to be "entirely avoidable". But Coroner David O'Connell found no person to be directly responsible. Capt Jacobs died when he became trapped in the wheelhouse during the capsize near the mouth of the Calliope River. 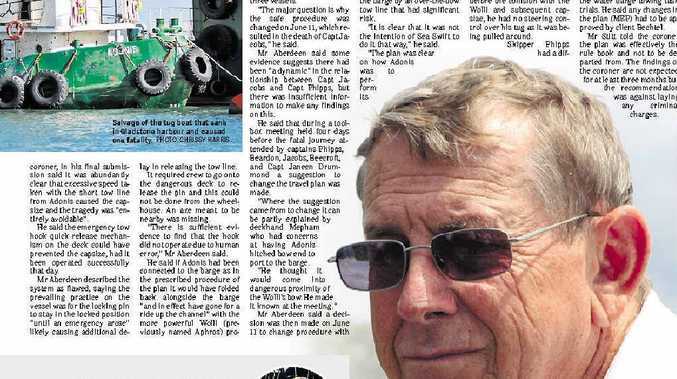 Mr O'Connell found the primary cause of the tug boat capsize was a failure by two tug masters Sean Bearden (Adonis) and Anthony "Tony" Phipps (Wolli aka Aphros) to adhere to a Marine Execution Plan (MEP) put in place by owners Sea Swift shipping for client Bechtel. Then as Adonis capsized during a towing of a barge there had been a failure of an emergency tow release. The more powerful tug Aphros had been the primary tug while the Adonis was only required to assist. In the plan it was to be secured by a bowline secured to the forward port side quarter of the barge and once under way the Adonis would simply "fold back" alongside the barge and be pulled along by the barge. Instead an ill fated decision was made to tow over the stern which Mr O'Connell said was a significant risk when towing a non-powered craft. Mr O'Connell found this was one of a number of departures from considered appropriate work practices. He states excessive speed was clearly a factor with an appropriate speed to have been 6kn. Mr O'Connell found that the vessels tracking system AIS showed they were moving at a speed of more than eight knots. "The capsizing was an entirely avoidable incident had the masters of the tugs simply adhered to the MEP," Mr O'Connell found. "The tug Capt Jacobs was travelling on 'girded' when the towline moves from pulling over the stern, to pulling over the side of the tug. "It is dangerous because it causes the tug to roll over, or capsize, very quickly." The MEP had been the only plan approved by then Harbourmaster Capt Mike Lutze and yet after successfully practiced the masters departed from this which Mr O'Connell calls "very perplexing". "In practical terms no amount of training or guidance can prevent an incident where individuals simply choose to ignore the established safe method for operation of work," Mr O'Connell states. "The course of events which led to the capsize of the tug Adonis was that masters of both vessels, at the instigation of Master Phipps, was to depart from the MEP, and instead implement an over-the-stern tow for the tug Adonis. "This was inappropriate in the circumstances, and entirely contrary to the authorised, and already then practised, approach set out in the MEP." He found there had been discussion essentially between Master Phipps (the more senior master) and Master Bearden for a change to an over-the-stern tow. He states that from evidence given, the only point raised by Master Bearden was to ensure that their speed was kept down so he could move appropriately as required. He said evidence from Master Bearden was that he radioed Master Phipps three times to slow down. However, Master Phipps evidence was there had been one call and he was never asked to slow. Mr O'Connell said this evidence needed to be resolved and the failure to slow down "perplexing" but he was unable to determine whether slowing would have prevented the capsizing. Capt Jacobs was not a master that day, acting only as an assessing "check" pilot to Master Bearden.